Former Trump Aide Sam Nunberg had refused any subpoena, but then confessed everything and now praises Special Counsel Mueller's investigation is "not a witch hunt"
VietPress USA (Mar. 10, 2018): Sam Nunberg, 36 year old, a former political aide to Donald Trump from 2011, making him one of Trump's earliest political advisers, but he was fired from the Republican's campaign in August 2015 before the heat of the 2016 presidential race. On Mar. 5, 2018, he said that he refuses to accept any subpoena from Special Counsel Robert Mueller for every emails between him and several former campaign aides including Steve Bannon, Hope Hicks, Paul Manafort, and Roger Stone (https://www.vietpressusa.us/2018/03/sam-nunberg-former-trumps-campaign-aid.html). Yesterday on Friday Mar. 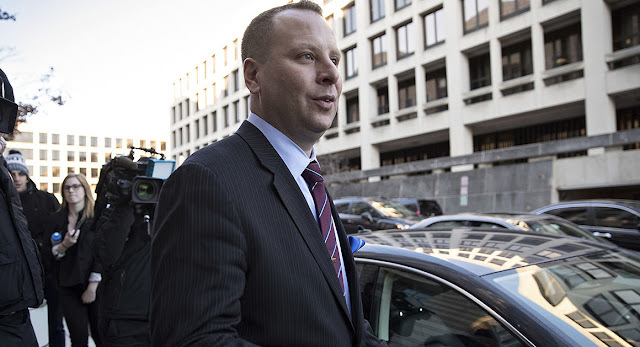 9, 2018, Sam Nunberg testified before a grand jury for more than six hours in the investigation into Russian interference in the 2016 presidential campaign. Complying with the subpoena, Nunberg said, was something he felt he needed to do as an attorney and was his "duty as an American, whether I like it or not." If he did not comply, he risked being jailed. The Politico reported that "Former Trump campaign adviser Sam Nunberg on Saturday pushed back on criticism that his media blitz over a subpoena from special counsel Robert Mueller was a meltdown, adding it was always his intention to comply with the ongoing Russia investigation. "People I say I had a meltdown on TV; I melted TV down that day," Nunberg told ABC News reporter Tara Palmeri. "I wanted to show what this independent counsel, this independent investigation does to people like me." The probe by Mueller into whether Russia interfered in the U.S. presidential election and possible collusion by the Trump campaign is “warranted,” Nunberg told ABC News. He made the comments after testifying for close to six hours before a grand jury on the Mueller probe. He said he was questioned about whether he ever heard Russian spoken in the office, and why President Donald Trump supported Putin in Syria. He said he doesn’t “believe” the probe will “lead to the president.” But he thinks others in Trump’s inner circle could be in trouble, particularly Roger Stone. Nunberg was fired as a Trump campaign adviser in 2015 after racially charged social media posts he allegedly wrote surfaced. He denied writing them. Check out the rest of the ABC interview above.